It’s no secret: I struggle with wardrobe decluttering. In my minimalism journey, this has been the hardest area for me to let go. I keep at it, because I know that practise makes perfect, and that decluttering gets easier with time (flexing those decluttering muscles is the only way to make them stronger). When I’m finally finished, the taste of success will be oh so sweet! About this time last year I undertook a mammoth wardrobe decluttering session, and I photographed everything in my wardrobe. I say mammoth not because of the amount of items I discarded, but because owning so many things made it a big job! I removed every single item of clothing I owned from my wardrobe, shelves, those items hanging behind the door, languishing in the laundry basket and generally distributed about the flat, and made a big pile in the living room. Techinally, several piles. 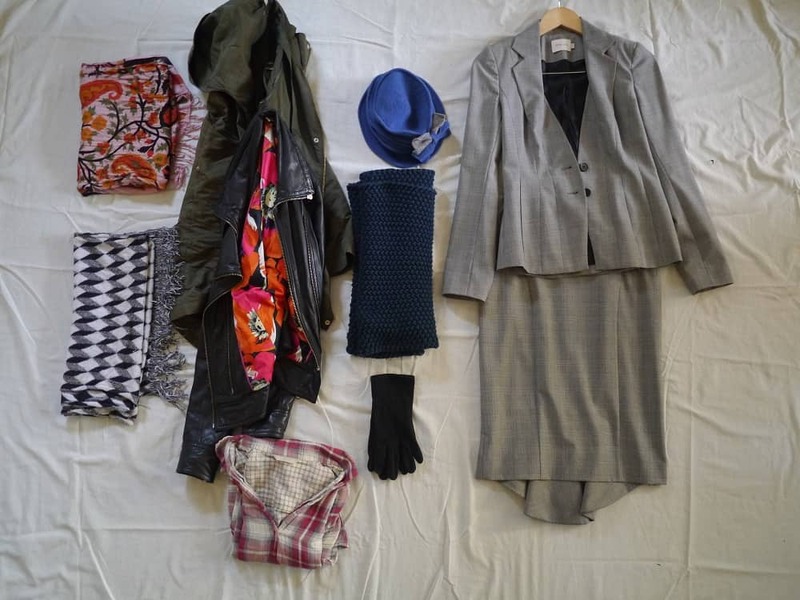 I lay a sheet out on the floor and category by category, grouped together everything I owned, took a photograph and then considered what I could do without. Once those items were decluttered, I took another photo for prosperity. You can be really clear about exactly what you own. You can group things together so you can see exactly how many of every different type of item you own. Physically moving everything makes you realise exactly how much you have. Clothing is surprisingly heavy, and actually lifting and feeling this is much more powerful than glancing at a rail of hanging items. It’s harder to ignore something when it’s in your hands. You can’t miss it, or skim over it, so you consider every single item independently. Originally, I took photos to write a blog post, but I found it very useful as a tool for helping me see what I owned. I think being able to visually see everything is actually far more helpful than a list. 10 skirts sounds like nothing, but when I see 10 skirts in an image, I see that is far too many! It’s also helpful in working out what goes with what, far more than a list will. One year later I’ve repeated the process. These pictures show the journey from August 2014 (pre- and post-decluttering), and my progress in October 2015. Remember that my wardrobe decluttering journey actually began 2 years prior to the first pictures in 2014, and clearly I still have quite a way to go! And this… folded smalls Marie Kondo style! These boxes sit in the shelf in my wardrobe where the heaped pile of mess used to be, and in 2 months it has not got remotely untidy. Folding works! Tops and shorts pre-declutting August 2015. I can’t believe looking at this that I used to own so many tops! 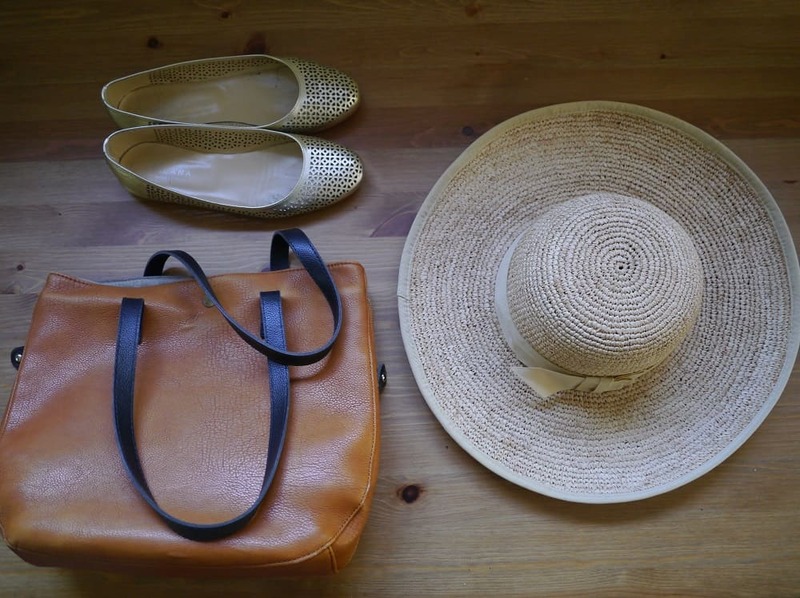 Tops and shorts post-decluttering August 2014. 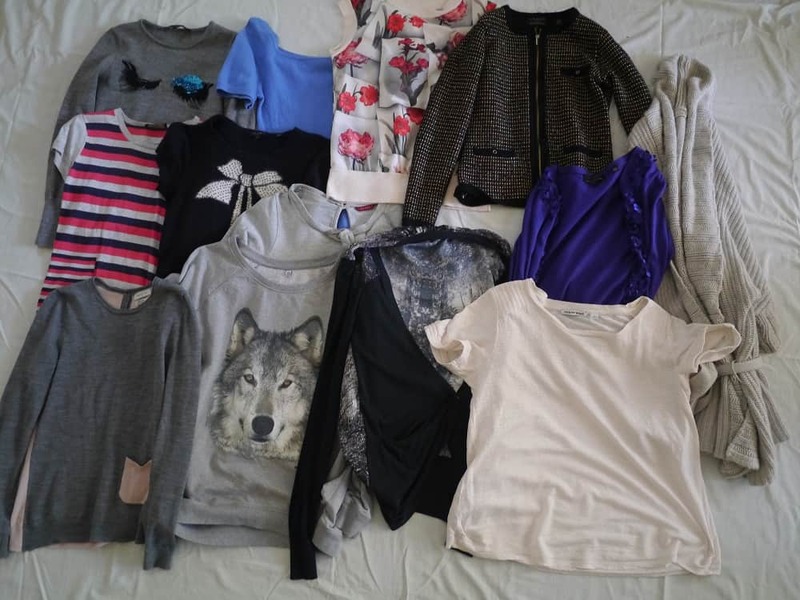 Shirts, blouses and other tops pre-decluttering October 2015. The thick British shorts are gone, and the green top is a cycle top which helps avoid sunburn when out on my bike. 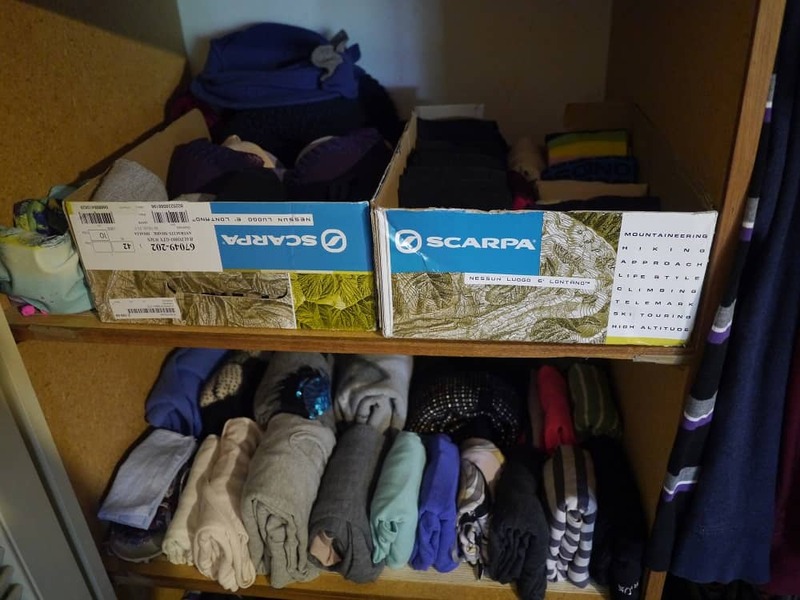 Shirts, blouses and other tops after decluttering October 2015. Skirts August 2014. The pre- and post- images are exactly the same as I only got rid of one (the denim one at the front). How many did I wear between then and now? Honestly? Less than half. Skirts decluttering October 2015. One of the yellow skirts wore out, I donated the other denim skirt when I went back to the UK, and the coral skirt ended up in the charity shop pile before I took this picture. Jumpers pre-decluttering August 2014. Woah, that is a lot of jumpers for someone who lives in a city which has 40 degree summers! Post-decluttering August 2014. Well, I say post-decluttering, but there’s not much difference! Jumpers Decluttered October 2015. The cream cardigan on the right is old and somehow escaped the August photos – it must have been in the laundry. I decided to donate the black cardigan right after taking this picture. 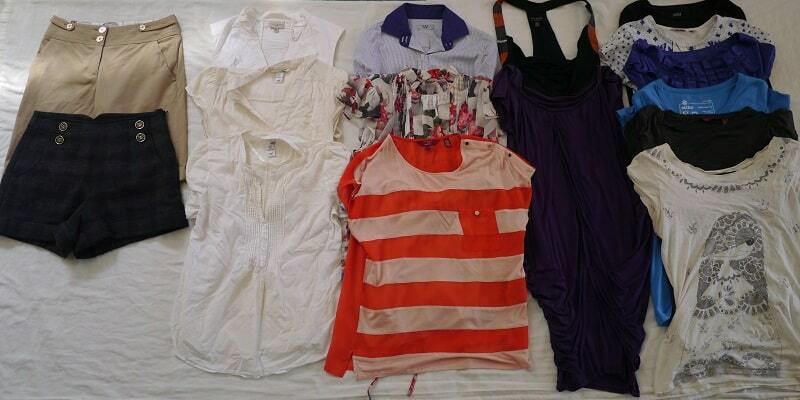 Dresses pre-decluttering August 2014. Looking at this image now shocks me – how can I have owned so many dresses that I wore so little?! 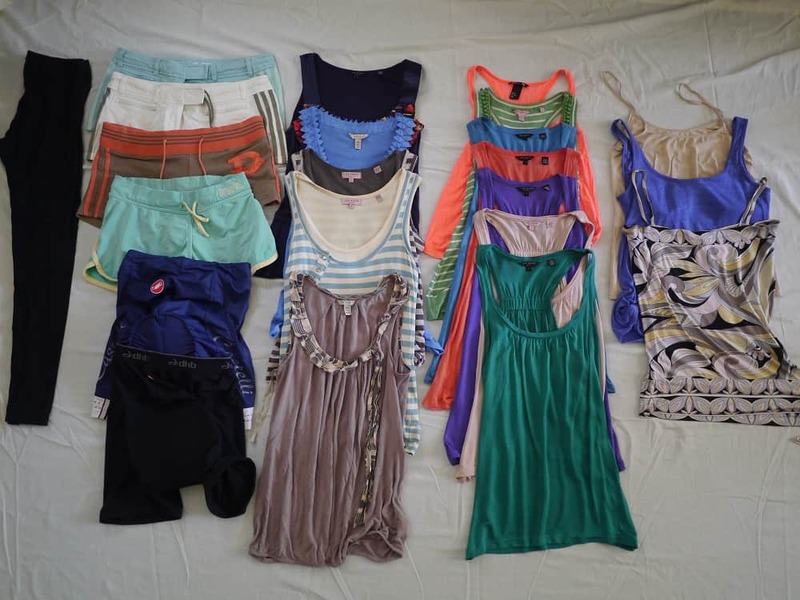 Dresses post-decluttering August 2014. Good effort, but a long way to go! Two of those dresses weren’t worn the entire summer in between 2014 and 2015. 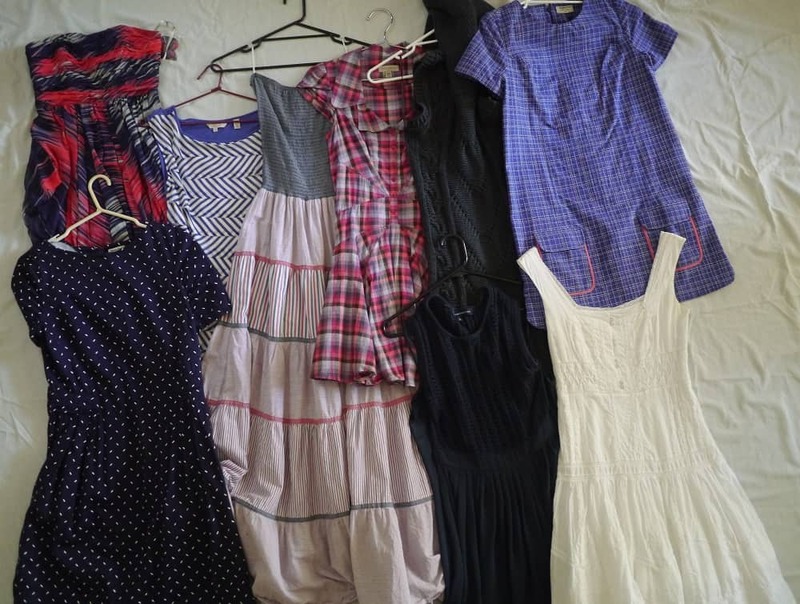 Dresses post-decluttering October 2015. Two gone, but two new ones have taken their place. Hopefully these will get the wear they deserve! I’ve taken Marie Kondo’s advice to fold jumpers and t-shirts. They are easier to find, don’t take up as much space and folding means I’m more aware of their condition (spills, rips etc). Love this approach! 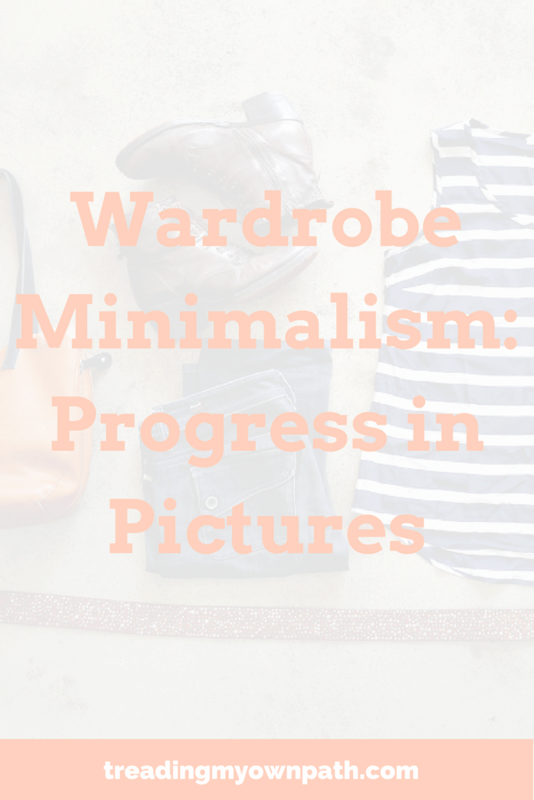 Since taking these photos, and writing about my minimalist wardrobe struggle back in October, I’ve had a bit of a wardrobe minimalism breakthrough. Yes I have! A large part of it has to do with all the helpful comments that you left with advice and tips. They didn’t fall on deaf ears, quite the opposite, and I want to thank you all for providing well needed advice. Stay tuned, because I’m looking forward to sharing the next chapter with you shortly! Now it’s your turn, and I want to hear from you! Now you’ve seen my wardrobe in all its, er, glory…I’d love to hear what you think! Any areas for improvement? Any glaringly obvious mistakes or inappropriate (mis-matching, for example) items? Anything I could add to make what I have much more usable? Any colours missing or over-represented? Any parallels with your own wardrobe minimalism struggle? Anything else you’d like to add?! Please keep the advice coming in the comments below! Thanks – it looks good when I see the photos, but when I open those wardrobe doors I know I still have a long way to go! Inspiring! I can’t wait to see what else you do. My strategy is to try and get rid of a few pieces for EACH quality piece of clothing I accumulate. I don’t really like any of my clothes, but I think this is working so far :) Why have a bunch of crappy polyester skirts when I have this one beautiful tencel skirt? I have this problem…I don’t like a lot of what I own! Mostly because it is old (some of it is very old!) and I guess I’m sick of it, or I’ve changed, or it’s been worn to death – for some pieces almost literally! That’s what I’m working towards…except I’m keen to have everything I own being made of natural fibres too. We’ll get there! Hi from a fan in NZ approaching 70. Love following your process, I’m on the path as well, and actually quite enjoy the annual clear out. You can imagine how much more you can accumulate over the years. 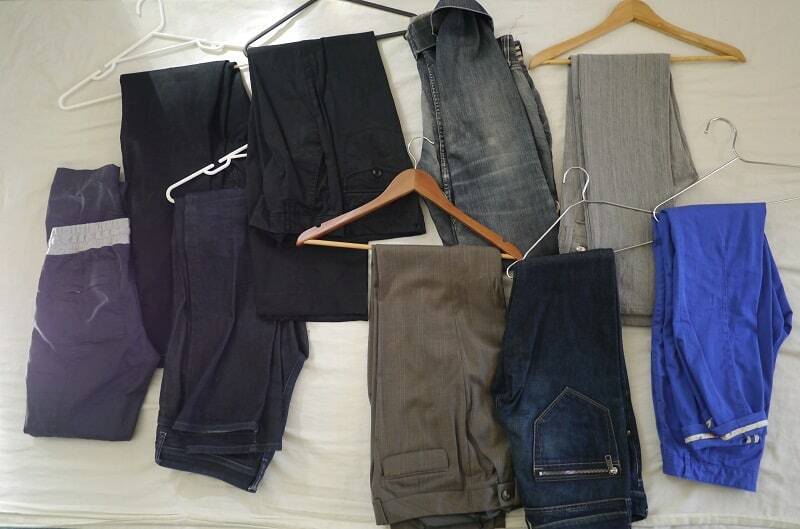 Moving from the US to NZ helped focus on clear out but still… I’m a big fan of recycled, gently used clothes. You can really see what has quality in terms of construction and fabric; what has washed well. I love being able to go for some classic style I can make my own with a favourite piece of fabric or jewellery. I sometimes throw caution to the wind to wear something fun and frivolous that makes me feel good that I wouldn’t normally choose, and I love finding something ethnic. Japanese clothing is particularly easy to bring into your wardrobe, layering, and such beautiful fabric. Hi Deb, thanks for commenting! I’ve seen my parents’ and my in-laws’ closets so I don’t need to imagine! ; ) Moving overseas helped me, for sure. I’ve been buying second-hand for a long time ,choosing brands I trust, but now I want to switch to natural fibres it’s a whole new learning curve. Still, it will be fun! Thanks! It’s quite fun being able to look back and see the journey unfold. My husband is fairly good, but he insists on rotating his clothes evenly which meant that ALL of his clothes wore out at once. Literally, he had about 6 shirts rip in about 2 weeks. It was ridiculous! So then he went from lots to nothing, and had to go on a shopping spree…never a good thing! And he probably bought more than he needed in the end : / But as his wardrobe is half what mine is, I can’t really complain! HAHAHA! 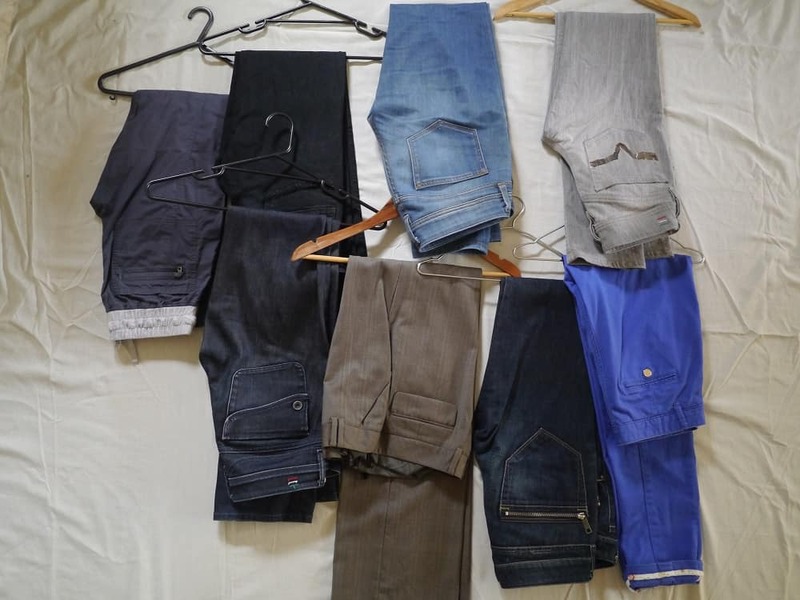 I rotate my clothes as well to give them all a “fair chance” to be worn – and it also shows me what isn’t getting worn. We tear up un-donatable shirts into rags for the garage/cleanup/etc. which are great. Amazing! 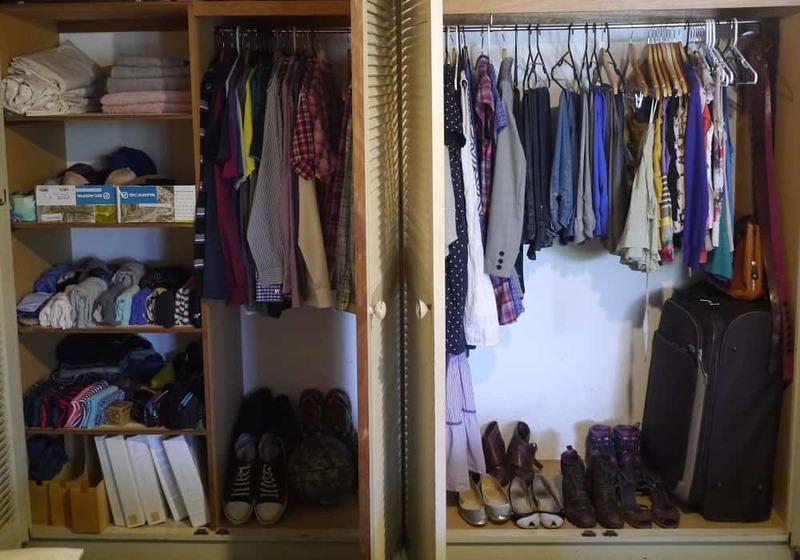 I am going to be doing this soon as part of my minimalism challenge! Great read with useful tips. Would never have thought to take photos – will be doing that. This is so impressive! I feel like every few months I am having a massive wardrobe clear out, I throw so many clothes swap parties & just keep accumulating more! But I am slowly working at it. What do you do with clothes & smalls that are too worn out to donate? Thanks Amanda! It didn’t feel impressive at the time, it felt like a LOT of work and effort for little result, but now I can see that I’m starting to get there. I’ve never been to or held a clothes swap party – tell me more! What is so great about them, and why do you think you end up accumulating more? Gosh, you really do get a sense of the volume of clothes when they’re exposed and out of the safety of your wardrobe! I try to have regular clear-outs but I’m overdue a major cleanse and this may well be a useful exercise to follow. The thing I struggle with though is the emotional attachment I seem to have to a lot of my clothes but I’m slowly getting better at letting them go! That is exactly it Natalie! when they are all hanging there, minding their own business, it really doesn’t seem like a lot…but when you haul them across the house and line them up for inspection, you see them for what they really are! When I have the perfect capsule wardrobe (!) I’ll take great enjoyment at looking back at these pictures. The journey is the important bit, where the lessons are learned, after all. The end IS in sight! This a problem for me too. I tend to “archive” the things I love, even if they’re no longer suitable for me to wear. I got rid of my business clothing though, and as a retiree living in jeans, am a bit stumped now about an invitation that says “no jeans — business casual”, just when my remaining travel-smith dresses are too lightweight for this season. You’re lucky you don’t need winter clothing. Great work! This post fascinated me – which was interesting as I read it with someone over my shoulder and I explained your/our purpose and interest. She couldn’t be more baffled or bored with the concept. Funny how everyone’s journey is so different, but i loved reading how you’d paired down. Haha Sarah, that’s so true! I remember seeing a YouTube video (I think it was on True Cost movie) with a bunch of girls showing all their fast fashion purchases to the camera – all these girls have pretty big followings, and I was completely baffled as to why anyone would be interested! Your last comment made me laugh as I love seeing your pictures of your clothes! Not only interesting but I find it fascinating! I am a constant declutterer and I tell them as long as I wear you, you can stay! If I don’t someone else can have you to wear! Before buying anything I like to think in terms of wearing 30 times …preferably more! I also like to give all a turn! Another thing I do is cut of the labels as they are so uncomfortable! A lot of trouble in getting comfortable footwear and they quickly get the opportunity of another owner if uncomfortable!